Although I am not an expert on this subject, I have developed a reputation for being the first "sucker" on the block to try almost any product for roses which is touted to be either natural, organic, non-toxic or environmentally friendly. I am also relatively observant regarding the effects of these products on my roses. First let's get some definitions straight. In many cases they may overlap, but at least you will understand the term as I use them. "Organic" refers to products derived from something that was previously alive (contains carbon). "Natural" refers to those coming from nature (which includes things which are mined from the earth). "Non-toxic" refers to products which will not make you or the environment sick (or dead). "Environmentally friendly" products may contain some toxic elements, but do only minimal damage to things they come in contact with (relatively speaking, they're a lot less harmful than, say, DDT). When I first started growing roses I used Miracle Gro. Occasionally I would throw on some steer manure or nitrohumus because I had learned from time spent on a farm as a child that these were good things for making crops grow. Beyond that, I knew nothing about amending soil or fertilizing. As I became more involved in growing roses, I listened to the early "gurus" pushing organics and shouting about "feeding the soil." Again what they said reminded me of what I had heard on the farm. When I heard that alfalfa had some special growth stimulant (triacontinol), it sounded like just what I needed to grow exhibition roses. So I decided to try the "organic method" of growing roses. There were no commercially available organic fertilizers then. So I went to the local feed store and bought huge bags of various meals and mixed them up in a wheelbarrow according to a recipe I found in our society newsletter. It was time consuming and messy. It was also less than an exact science. And, since I had to buy the stuff in 25 or 50 pound bags, I usually had lots left over in the garage to attract mice and rats. Now those problems have been eliminated. Look around your local nurseries and in your catalogs. Everyone is jumping on the bandwagon. There are rows and rows of organic and natural products available. I will concentrate, for the most part, on the products that seem to be easily found in our area: Whitney Farms, Dr. Earth, and Mills Magic. First a few words on the use and benefits of organic fertilizers. Organics are released slowly over a long period of time, and depend on the activity of soil organisms to break them down to release the nutrients. And they are effective only when the soil is moist enough and warm enough for the organisms to be active. This means that organics must be added to the soil early in the growing season to give enough time for them to be broken down so that the plant can use them when they are needed. I add organics at the very beginning of each bloom cycle. It also means that you need a good layer of mulch to provide the warm, moist soil conditions required by soil organisms. 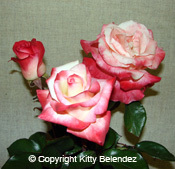 There are several reasons to recommend using organic fertilizers on roses. The fact that they do break down slowly means that they provide a constant source of nutrition at low concentrations. There is, therefore, less potential for burning your rose bushes and they do not leach out of the soil as quickly as chemical fertilizers. Over the long haul they will provide as much or more nutrition to the rose as chemical fertilizers. They also have the added benefit of improving the physical structure of your soil. Your soil, the micro-organisms in it, and your worms need some sort of organic material to keep them healthy, whether it be through fertilizer, soil amendments or mulch. You cannot provide what your soil needs through the use of chemical fertilizers alone. The fact that a fertilizer is organic does not mean that it is completely safe and can be applied with bare hands. Many of them carry cautions similar to those on chemical fertilizers: do not inhale, keep away from children and pets, do not swallow, may cause skin irritation, may be attractive to pets. Some, blood meal in particular, can burn your plants if too much is used. With any fertilizer, read and follow the instructions on the label. The primary benefit of the commercially available products is that the guesswork has been removed. They have mixed the proper amounts of the nutrients your roses need in the proper proportions and they tell you how much to feed each plant. The companies that make them also have the advantage of being able to procure some of the more obscure ingredients you might have difficulty finding. The chart in this article gives you some idea of what the ingredients most commonly found in these fertilizers do for your roses. Mills Magic Rose Mix is only available to us by mail order. It contains alfalfa, steamed bone meal, cottonseed, activated sludge, and organic compost activators. It has a nutrient content of 6-5-1. It costs about $25 for 20 pounds. Many who use it swear by it. There is, however, some question about the efficacy of using sludge which may leave heavy metals in the soil. Whitney Farms, which I have used, with great satisfaction, for several years now is available at OSH and Armstrong Garden Centers in Southern California. Their rose food contains bone meal, alfalfa meal, blood meal (a "fast acting" organic source of nitrogen), feather meal, sunflower hull ash (a source of potassium), dried poultry waste, and kelp meal. It has a nutrient content of 4-6-2. It costs about $14 for 15 pounds. I did notice that they have amended their label to recommend that it be tilled into the soil to keep pets out of it, and they recommend that you wash your hands after applying it. I don't know for sure, but would assume, that this is a result of the debate over whether "mad cow" disease can be spread through the use of bone meals from possibly infected animals. I won't get into the debate, but to be on the safe side, I now use superphosphate in my planting holes, and I always wear rubber gloves when I work in the garden. This is a wise practice no matter what you're working with. They also produce many of the single ingredients used in their rose food separately in 5 lb. boxes (they also make boxes of things like Sul-Po-Mag, superphosphate, dolomite lime, etc., in small boxes). At the CR seminar put on by South Coast Rose Society, which was by the way, one of the best I have attended, one of the speakers was a representative for the Dr. Earth line of organic products. I am familiar with their products, and intend to use them in the future. Their rose food contains cottonseed meal, fish bone meal (eliminating the questions regarding cattle), alfalfa meal, kelp, potassium sulfate, and rock phosphate. What I find most intriguing about their product is that they also add beneficial microbes (which their rep said decreases the time needed for the food to become available to the plant). Their nutrient content is 5-7-2. A 12-pound bag costs about $15. In addition to the rose food, both Whitney Farms and Dr. Earth are now producing "designer" potting soils which incorporate many of the ingredients I used to add to my planting mix. Uncle Malcolm's Potting Soil by Whitney Farms contains softwood bark and sawdust, peat moss, perlite, pumice, animal manures, bat guano and kelp meal. Garden Bloom Rose Planting Mix, by the company that produces Dr. Earth products, contains fir bark, forest humus, peat moss, perlite, worm castings, chicken manure (highest of all manures in nitrogen content), alfalfa meal, bat guano, bone meal, oyster shell and dolomite limes. Again, it may be more expensive in terms of dollars, but it saves money in terms of time. To further complicate the picture, there are now several other organic/natural products you can add to your fertilizer program to give the roses an extra boast. Bob Martin and Kitty Belendez have both used SuperThrive for years now. Neither will swear it makes a difference, but they use it anyway, "just in case." Many exhibitors have begun using Response. It is a seaweed extract you mix with whatever you're spraying. Seaweed has been reported to improve the vigor and disease resistance of your plants. I like the "response" I get from it, and judging from the number of people who have asked me if I'm going to do another "bulk buy,' I guess they do, too. The only caution with this product is not to use too much as it does seem to enlarge the size of the foliage to the point of being "gross" in proportion to the bloom size. Primary Products carries Endogenous Hormone Rose Cocktail, a blend of hormones and nutrients that improve root growth and plant growth rate and vigor. I have not used it and don't know if it works. It does seem to be very expensive. I have tried the mycorrhizae innoculant cocktails. In scientific tests they increased the growth rate of plant and root system and bloom production. I did not use it in the planting hole (the preferred method of introduction), but I did follow the directions for introducing it to established plants. I faithfully fed those plants nothing but organics and nothing with high phosphorous content (which will apparently kill them). I saw no difference in the growth, in my garden, between the plants that got "innoculated" and those that didn't, either the first year or any year thereafter I also saw no difference in the size of their root systems when I shovel pruned them. This product was also very expensive. On a recent trip to Orange County Farm Supply Company, a product called The Master Gardner Answer Bio-Stimulant caught my eye. It is "approved for use by certified Organic Growers." It supposedly "shields against harmful chemicals ... protects, nurtures and stimulates microbial life ... and improves the availability and intake of nutrients." I asked Chris (the salesman, and a friend) about it. He said it "really does work." He also said he'd reduce the price of it from $30 a pint to $15 "just to get it off the shelf." Being the optimist (and "sucker") that I am, I bought it. I'll add it to my fish emulsion when I feed tomorrow. I'll let you know if it works ... on second thought, since I'm an exhibitor always looking for an edge, if it works, I may not. available in trace amounts in manures. Chlorine Good growth. Malformed foliage. Copper Good growth. Poorly developed tips. Manganese Green growth. Pale mottling of leaves. Molybdenum Good growth. Poorly developed leaves. Zinc Good growth. Malformed growth. Originally published in the Summer 2001 issue of "Pacific Southwest Rose," bulletin of the Pacific Southwest District, Kitty Belendez, Editor. © Copyright Lynn Snetsinger, all rights reserved. © All photos copyright Kitty Belendez, all rights reserved.